First let’s talk about pork for a little bit. I like feeding my family hormone-free meat, antibiotic-free meat, grass fed meat, free range meat, all the happy, healthy kinds of meat. I have great local sources for chicken, lamb, and beef. But I almost always buy my piggies at the store. We don’t have pork very often, but shucks, pork is so delicious. We love bacon, ham, and sausage. My boys are athletes and often ask for meat in the morning (and all day long). I’ve decided that in order to keep life simpler (and to avoid completely killing my already very high grocery budget) – I’ll go ahead and buy pork products when I find them on sale at a regular grocery store. I don’t feel great about this, but I guess I feel good enough about it that I haven’t stopped doing it. So that’s that. 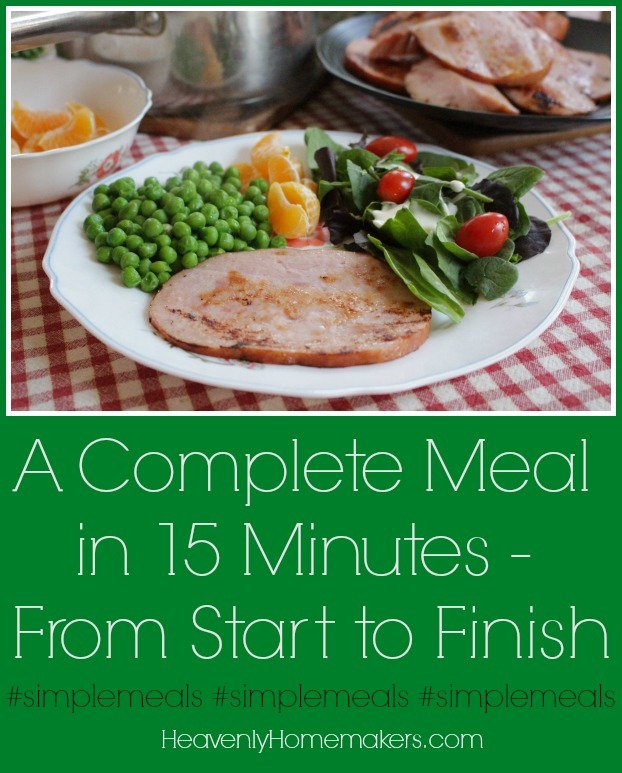 So now let’s get on with the fun part where I tell you how you can put a complete meal on the table in 15-minutes from start to finish! Sometimes I buy a pre-cooked ham as pictured above. I slice it all and put it in a Pyrex dish in the fridge to pull out as needed for quick lunches or to go with eggs at breakfast. Having this on hand is fantastic! This sliced ham fries up within a few minutes in a skillet. We’ll steam some peas and pull out the mixed greens and salad dressing. We’ll prep some fruit. Just like that, we’ve got a complete meal ready to eat. If you don’t feel good about eating pork, there are Turkey Ham options available – or maybe you’d enjoy another variety of meat that fries up quickly to complete your meal. Either way: Never forget the ease of steaming a veggie, prepping some fruit, and pulling out fresh greens to complete a meal. This is THE way I make our meals simple and nourishing. The variety of fruits and vegetables is so good for our bodies and feeding us like this takes only a tiny bit of effort! Are you pork eaters at your house? 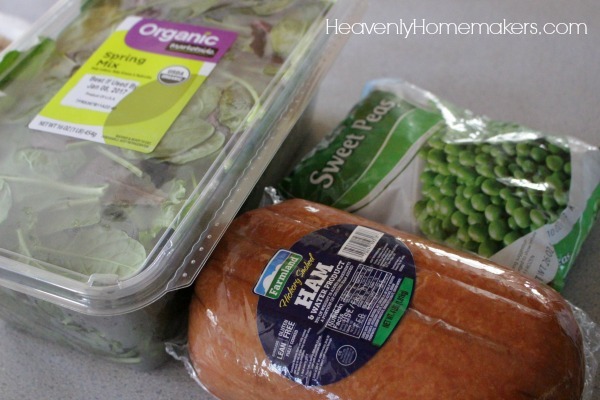 What meals have you found to be easy enough to throw together in just a few minutes? Join all of us who are enjoying Simple Meals! Laura! I found cara cara oranges yesterday at Aldi! YAY!!!!! We are pork eaters in our house but we eat a wide variety of meats – chicken, turkey, beef, several kinds of fish…so I also don’t feel guilty about infusing a little pork in the mix. And we’re Wisconsinites, so with the Germanic influence in our state, we eat a LOT of sausage as a cultural thing. I think if you keep the processed pork (i.e. ham and sausage) to a minimum and balance your pork meal well with lots of fresh produce and whole grains, you needn’t feel guilty. We eat pork minimumly (is that a word?!). Mostly just bacon that I get at Aldi if I need some protein to fill out our week. Honestly, from what I’ve read pork grosses me out so that’s why I don’t buy it often. We have friends who raise pork so we could get it pasture raised and fresh but we’ve never needed to. We just put a deer in the freezer and hopefully that’s not the last one for the season! So, unless we need some quick protein like bacon (because let’s face it, it is quick and it is yummy!) I usually avoid it. I do have a huge ham in my freezer that my mom bought me and I’ll cook it sometime because I never turn down free food! I love you honesty. We love pork too and only eat in moderation. Life is too short not to eat the good stuff once in awhile. I just purchased your simple meals and I’m excited!!! Our family LOVES pork! We have purchased our pork in bulk, once a year, for the last 8 years. It’s organic and pastured, and much, much cheaper to purchase it by the 1/2 hog (or whole) than by the cut. However, there is never enough bacon. So we buy bacon at Trader Joe’s after our bulk bacon is gone. It’s a compromise I’m willing to make, because I can’t live without bacon in my life, and I can’t afford to purchase pastured bacon outside of my bulk purchase. Personally, I’m not comfortable eating other non-pastured pork cuts on a regular basis. I am fine eating conventional pork at family member’s homes, and the occasional meal out. We buy 1/2 hogs from a local locker and I can’t eat store pork after having it from the locker. Also, Zaycon has excellent pork chops. I would guess you would have a fairly local locker, but email me if you want the name of the one I use since I’m more or less in your area. I love the convenience of whole hams, too; just got large spiral cuts for New Year’s — delicious, with a glaze packet. When I occasionally get a ham, I have some good recipes that use ham for leftovers, including a tasty one with caulifower (can send if you’re still interested in cauliflower recipes:)). 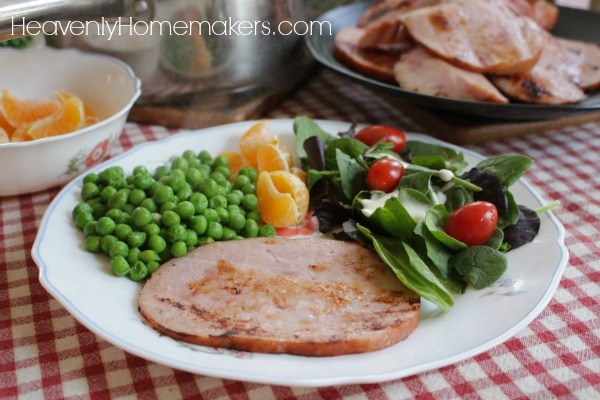 Other easy ideas: a ham steak — my husband used to make a meal with those accompanied by peas, salad, and Betty Crocker Au Gratins! Pork chops thrown in crockpot with wine or broth, a few herbs, potato chunks and veggies (bag of baby carrots would really be easy)…voila ~ dinner! Also, ham bone with some ham left or chunk of boneless can be combined with a bag of those mixed beans and can of tomatoes for soup — yum! Wow, just remembered a couple more super simple I just made: beef tenderloin with bacon (natural, uncured) layed completely over, into oven for about 40 minutes at I think 375, then ended with a bit of broiling. Based on a Guy Fieri recipe; I did not brown ahead in pan or make the sauce — it was delicious. Also, one of my favorites: pork shoulder roast (or other cut) in oven dish, pour bottled barbecue sauce and some white wine over, cover and cook for multiple hours on low heat. Good on rolls, with mashed potatoes, in tortillas, or just by itself!